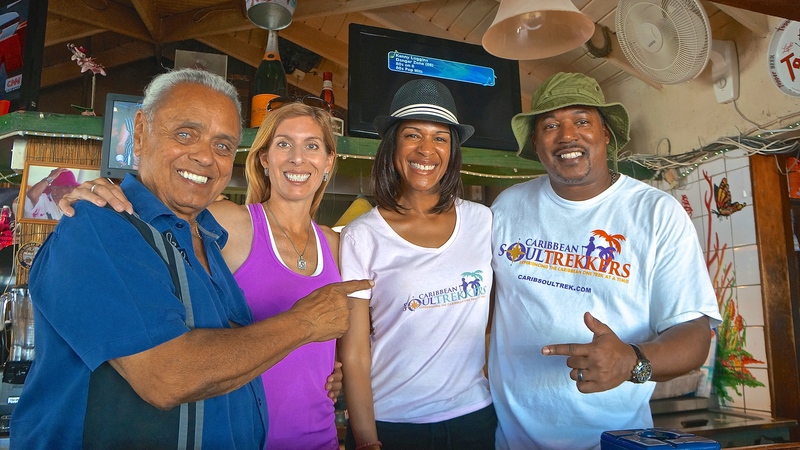 A few month’s back, sunset dinner at St. Maarten’s Topper’s by the Sea led to a chance encounter with affable manager Dave Herbert who opened our eyes (and tastebuds) to the rainbow of flavors offered by Topper’s Rhums (check out that story here). While Dave was happy to share the story of how Topper’s Rhum got its start and became St. Maarten’s only current export, he urged us to “stay tuned” for exciting future developments from Topper’s. Well, Soul Trekkers, the future is here! 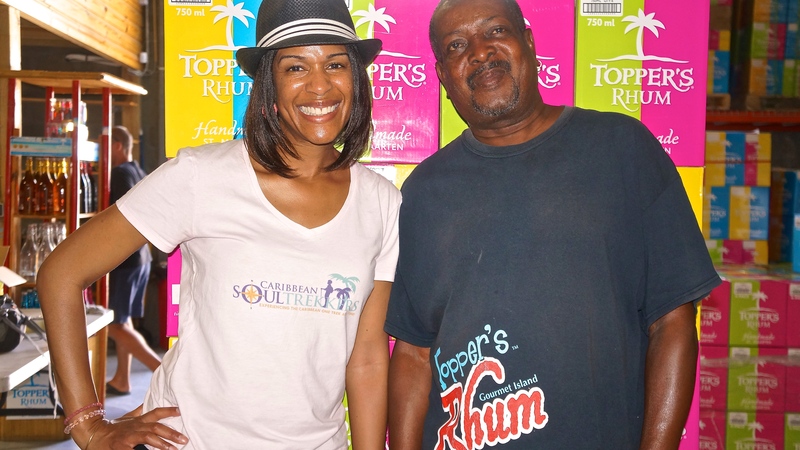 Topper’s Rhum is gearing up to offer some amazing experiences to the rum, sun and fun loving public and invited us back to St. Maarten to tell us about it first hand. Our Topper’s Rhum journey began fittingly enough at Topper’s Restaurant where we had an impromptu and down to earth chat with Topper himself. By the time Dave arrived, we were deeply enamored with the spunky, larger than life character and felt as though we were now in tune with the essence of the Topper’s Rhum brand – providing the public with a unique and unforgettable way to remember marvelous St. Maarten. 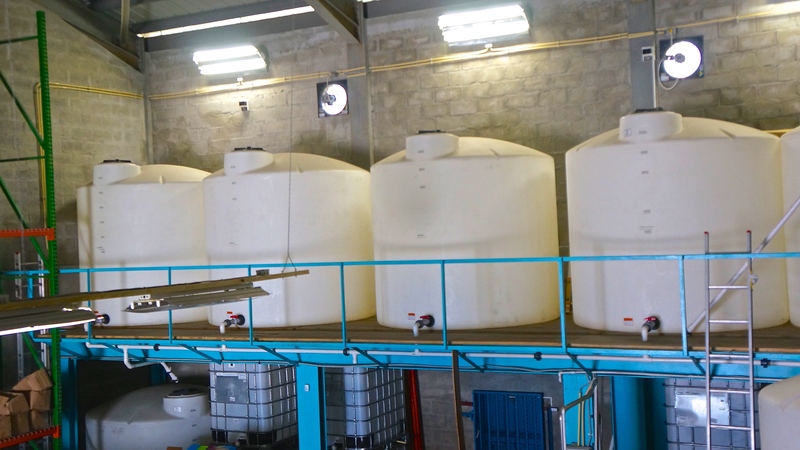 A short trek down the back roads of the Simpson Bay area brought us to the Topper’s Rhum Factory where an exclusive, behind the scenes tour awaited us. 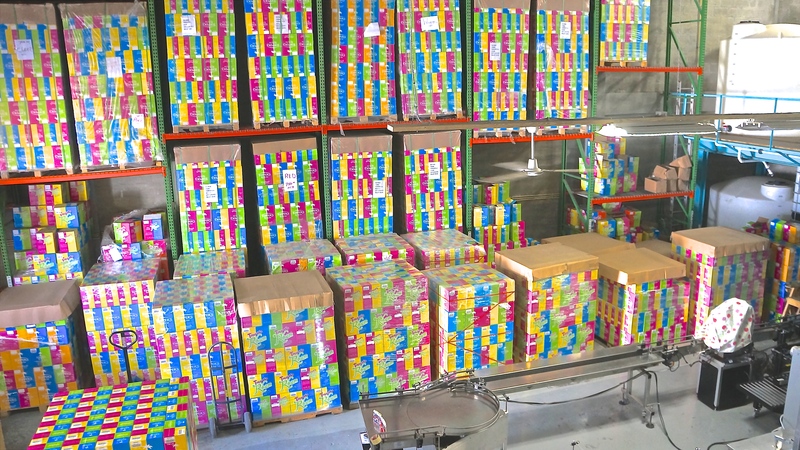 Despite its plain exterior, the interior was alive with the trademark, tropical colors of the Topper’s brand splashed across boxes stacked floor to ceiling and waiting for their turn to be shipped out. You might wonder, like we did, where to? Since our last visit, Topper’s has expanded its U.S. distribution and is now available in South Carolina, North Carolina, Alabama, Georgia, Massachusetts, Florida, Rhode Island, Colorado and Nevada. Of course, we did our best to pitch for DC to be added to the list. Let’s cross our fingers! 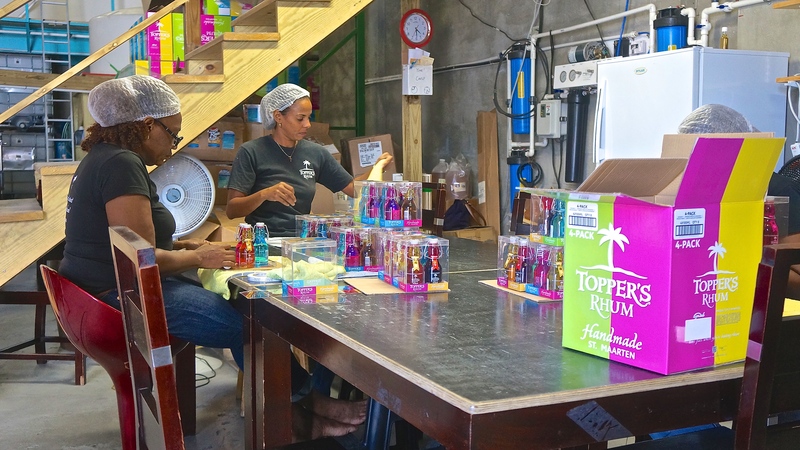 Topper’s Rhum Factory is committed to employing local talent from St. Maarten. One such employee was Tony, who partnered with Dave in giving us a thorough tour of the rum production process (most of which is done by hand) on the ground floor of the facility. 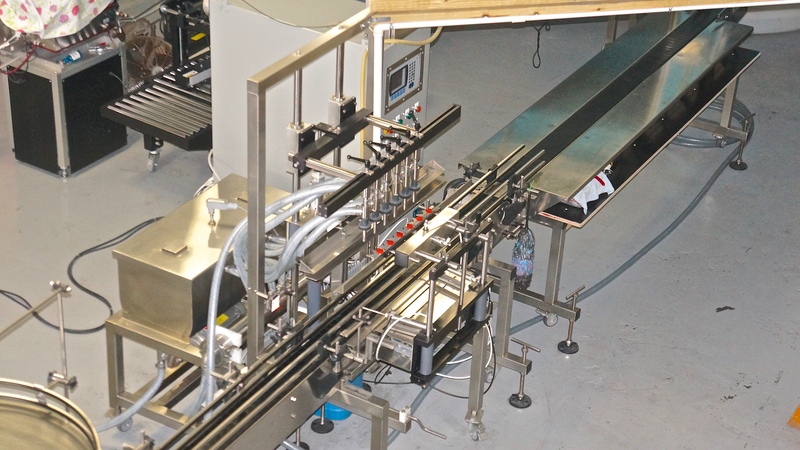 As Dave and Tony took turns enthusiastically described the crucial steps that take Topper’s Rhum from storage tanks to stylish bottles, one thing was clear – Topper’s takes great pains to ensure theirs is a quality product. Melanie, Topper’s better half and the brainchild behind these award-winning rum flavors and the brand’s distinct packaging, then arrived. She invited us in to her mad scientist lab and shared some of the secrets to creating the brand’s distinct rum flavors. Instruments for checking viscosity and sugar content were skillfully handled by this graphic designer turned rum maven. Mango Eddie and I winked to each other in synch’, silently agreeing that this charismatic lady sure does know her stuff. 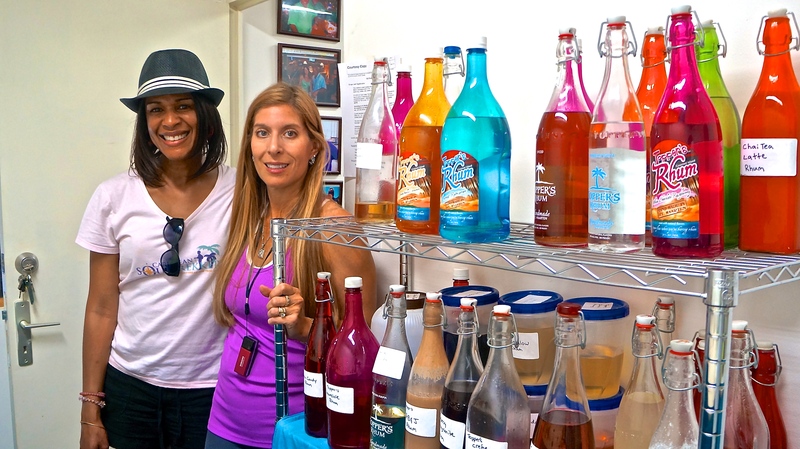 Though this Caribbean rum experience had already exceeded our expectations, it rose to a whole ‘nother level when Melanie asked if we’d like to sample some of her concoctions. Before I could say “hell yeah!” pours of her secret batches, including a few that will soon be released to the public, began to flow. It’s too bad that her PB&J Rhum probably won’t make it out (it’s sensational) but, take our word for it, the Salted Caramel and Mango Madness Rhums that will soon hit store shelves are sure to knock your socks off! Back on the ground floor, Dave then revealed exciting plans for St. Maarten tourists searching for a superlative Caribbean rum experience. Tourists will be invited in to the factory to sample Topper’s Rhums as they are being produced. A lucky few will even have the opportunity to hand bottle their own rums. A bartending school will also make its way inside the factory. Can you imagine how amazing it will be to watch (and sample) mixology competitions at this Caribbean rum factory? Sign me up! And we loved hearing that Topper’s encourages anyone to share new recipes created by bartenders or even rum enthusiasts at home because “We want this to be a fun experience for everyone!” What Topper’s rum recipes will you create? Topper’s Rhum experiences will differ based on whether guests will be visiting from cruise ships or resorts. For the former, a “Rhum and Beach Adventure” will be offered. It will include a full day experience inclusive of factory tour, lunch at a Topper’s restaurant, a day at Kim Sha Beach and transportation. For land-based guests, the experience will include a factory tour and early bird dinner at Topper’s. Either way, one thing is for sure. St. Maarten visitors are about to enjoy one of the most uncommon and interactive Caribbean experiences we’ve heard about in a long time! 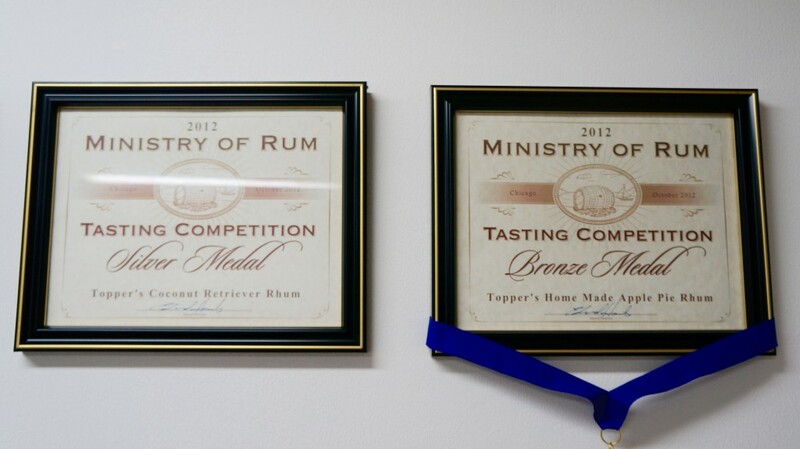 Trek Tip: Don’t leave St. Maarten without picking up a bottle (or two) of Topper’s Rhum to enjoy back home. 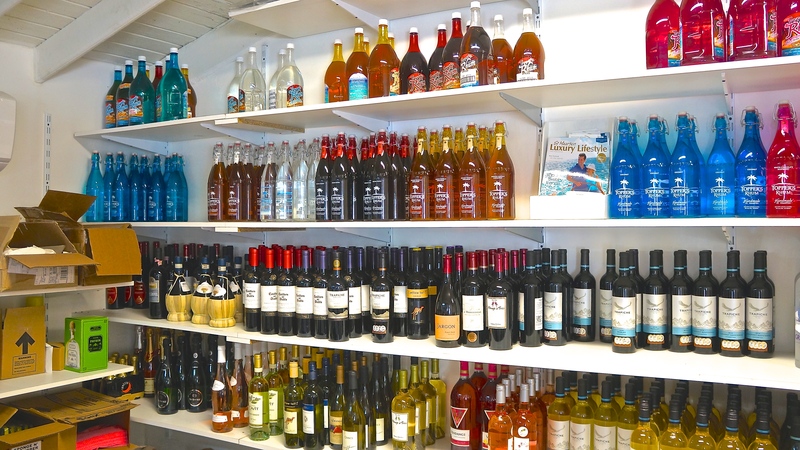 Topper’s Rhum is sold at Topper’s Restaurant and Bar, Topper’s By the Sea, several grocery stores in St. Maarten and at the airport.